One of my daughters tells me I should stop writing so often about older people who die. Maybe so, but more and more often I'll hear about a person I always considered a "young contemporary" dying..... but I don't hear anyone saying, "Oh, he (or she) was so young!" It tends to get your attention. Sandra Dee died this week. My goodness, she was the original Gidget. And wasn't that fairly recent? The first girl I ever kissed -(a real kiss, not the little peck you give Aunt Matilda)- looked just like Sandra Dee. She had dark hair but, aside from that, they looked the same, at least to me. I won't mention her name because, if by chance she's out there somewhere reading this, I would be embarrassed to reveal to her that she was my first real kiss. I never told her that. Anyway, who can forget Sandra Dee sizzling in "A Summer Place", opposite Troy Donahue? Years after seeing that movie, I attended a luncheon in South Carolina for Troy Donahue, and when he walked into the room, I still felt a tinge of respect and jealousy because of his relationship (in that film) with Sandra Dee. And, for what it's worth... here's a bit of trivia. The guy who played Moondoggie in the original "Gidget" is the actor/singer James Darren. When I moved to California in 1986, Darren lived about a block from me. When I was out walking, I used to wonder if, perhaps, I might spot Gidget dropping by the neighborhood for a visit. James Darren's son and I worked together at KCBS. His name is Jim Moret, and he became quite prominent on CNN during the O.J. Simpson trial. I think he still works for CNN. So, like the game "six degrees of separation" I do have a vague connection to Moondoggie, and thus to Gidget. 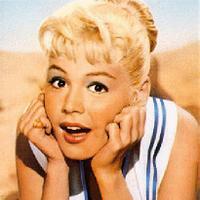 And, for reasons I'm sure some of you will understand, I was especially saddened to hear the news about Sandra Dee.